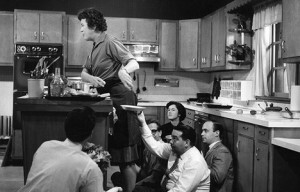 As much as Julia encouraged us not to be intimidated when cooking, many of us are when tackling Beef Bourguinon. Don’t be! Well, it’s OK to be a little intimidated when spelling it, but don’t be when cooking it. It’s a simple peasant dish originating from the Burgundy (Bourguignon) region of France, where the namesake Burgundy wine is produced using the pinot noir grape. The rustic beef stew is slow braised in Burgundy wine for hours and finished with glazed carrots, pearl onions and sautéed mushrooms. The peasants would assemble the stew at lunchtime with ingredients from the larder, put it on the fire to slowly simmer away the afternoon, and be welcomed by the wonderful aroma when returning home to dinner. I’m always a little astonished when someone mentions they’ve spent the whole afternoon (or day!) preparing beef bourguignon. Let’s unpack and demystify it a bit. Look at the recipe as two separate endeavors. The first is to make a simple stew, which follows the classic steps of browning and searing the meat, sautéing the aromatics (onions, carrots and garlic), deglazing the pan (with burgundy wine) and setting it to simmer with wine, stock and herbs. Sear and brown the meat in a big pan in small batches, setting the finished batch aside to wait on a paper towel while the other batches cook. Don’t try to brown the meat all at once or it will crowd the pan and steam instead of sear. 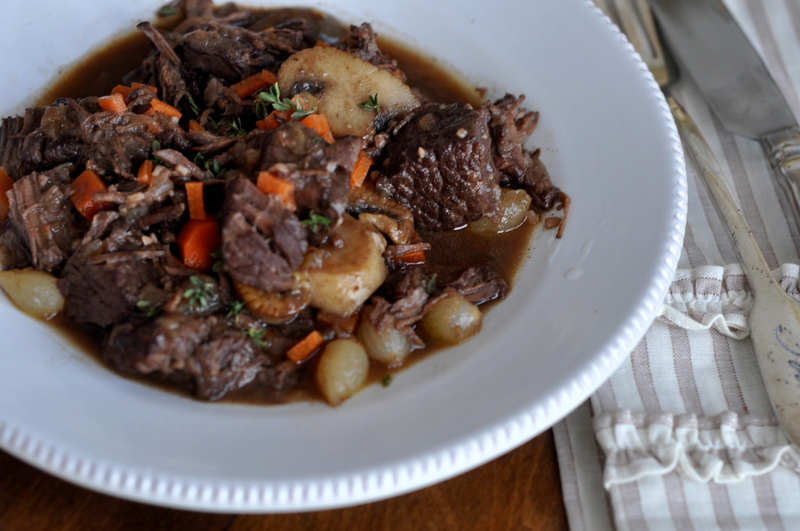 Costco has a great package of precut stew meat (usually chuck roast) perfect for this dish which is a great time saver. After the meat is seared, pour off any remaining fat. 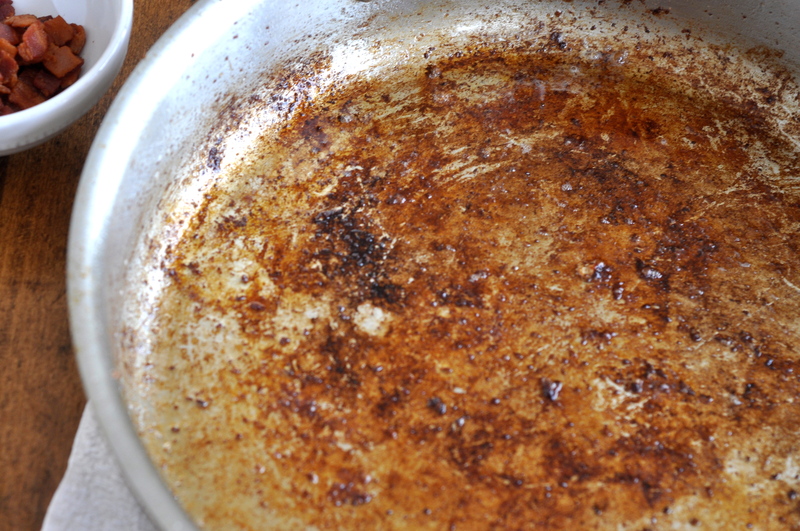 The caramelized brown goodness left on the bottom of the pan is called frond and is irreplaceable in creating a tasty stew. 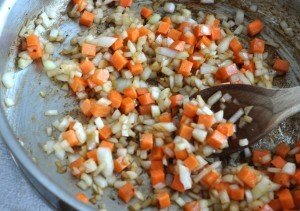 Add the onions, carrots and garlic and sauté until translucent. I love to dice all the vegetables by hand, but if I’m in a hurry I’ll throw the vegetables in the Cuisinart to dice. The classic herb addition to Beef Bourguignon is bouquet garni, basically a bay leaf, 2 sprigs of thyme and three sprigs of parsley tied in a bundle and dropped in the pot to flavor the stew. It is retrieved from the pot before serving, hence the string to make fishing it out easier. 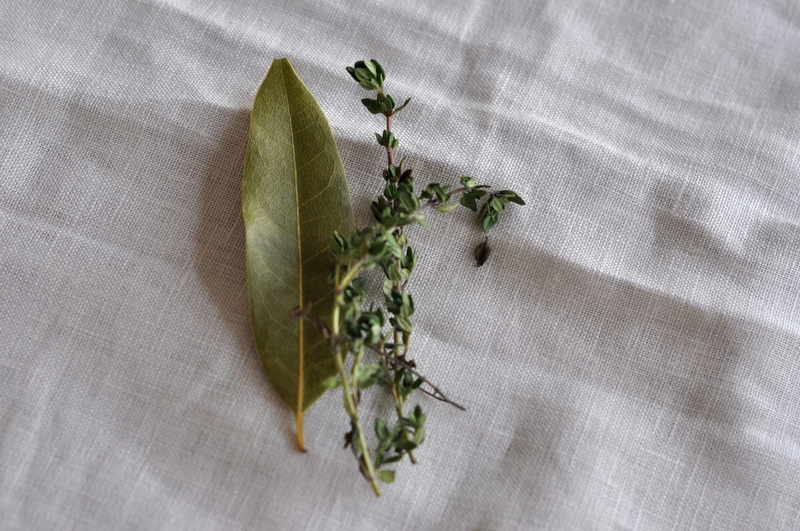 If you don’t have fresh herbs, toss in a teaspoon or two of dried herbs de provence instead. Add the seared meat back to the vegetables along with bouquet garni, wine and stock. 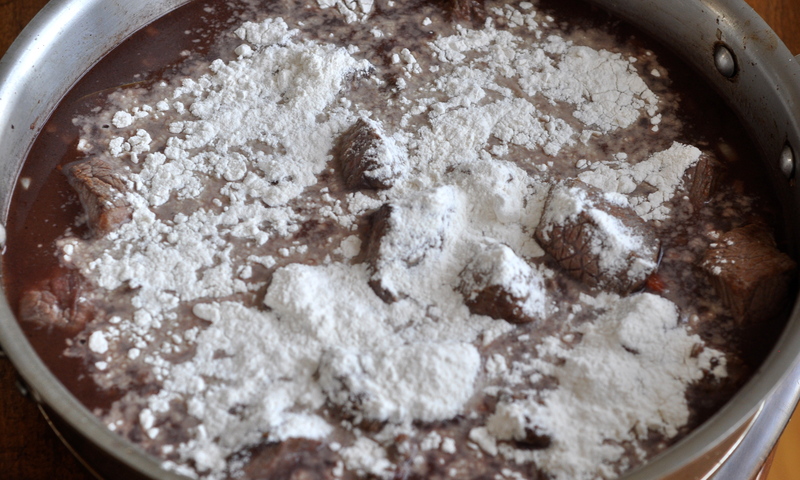 Sprinkle a little flour on top to thicken the stew. The second step is preparing the delicious extras which accompany the stew once it is served, sautéed mushrooms, caramelized carrots and glazed baby onions. The stew tastes absolutely delicious without the extras, but if you have time it’s fun to add them. Heat the oven to 300. Generously season the beef cubes with salt and pepper. Sauté the diced bacon in the bottom of a large dutch oven (8-10 quart) over medium heat until it is crisp and the bacon fat has rendered. Remove the bacon with a slotted spoon and set aside, leaving as much bacon fat in the pan as possible. If desired, add the cooked bacon to the stew after it is done before serving. It will add an additional smoky flavor. Increase the heat to medium high. Working in small batches, brown and sear the beef cubes in the bacon fat. 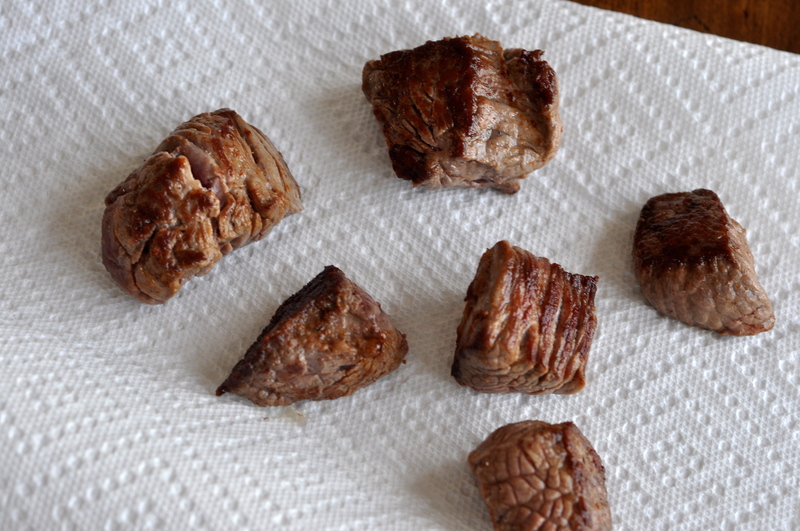 After they are seared, remove to drain on paper towels as you sear the next batch. Drain all the bacon fat from the pan. The pan will have a wonderful brown layer on the bottom. This is where all the flavor is packed! 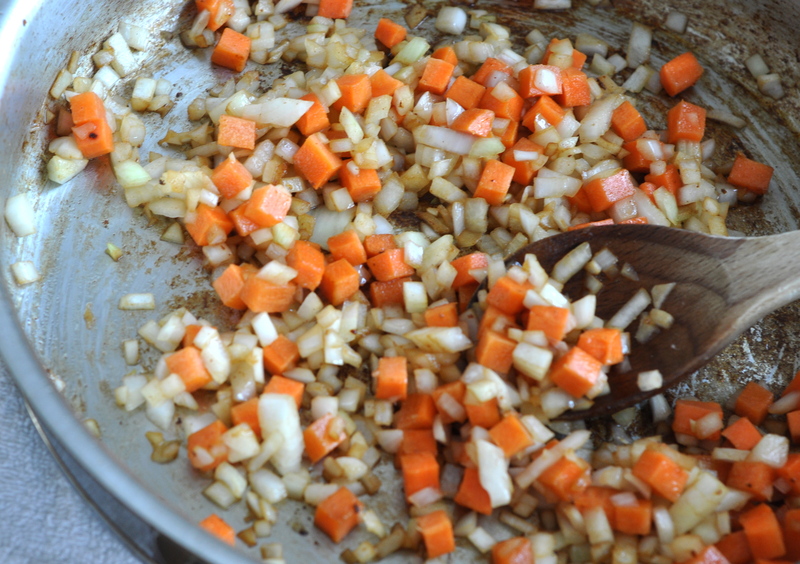 Add a little olive oil to the pan and sauté the onions and carrots for 5-10 minutes over medium heat. Add the garlic and sauté a few more minutes. Pour in the bottle of wine, stirring and scraping until all the brown from the bottom of the pan is incorporated. 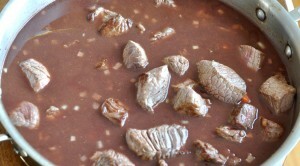 To assemble the stew add the seared beef cubes to the wine and vegetables. Pour in the beef stock. Add the bouquet garni or herbs de provence. Sprinkle the flour over the top of the stew. Cover and cook for 3-4 hours until meat is fork tender and shreds with a fork. While the beef is cooking sauté the mushrooms in butter. Seperately simmer the carrots disks in water until tender. Drain the water and sauté the carrots in butter, sprinkling a tsp of brown sugar on to glaze. Saute the pearl onion in butter, sprinkling a tsp of brown sugar on to glaze. 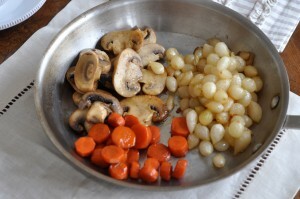 Add the extras to the stew and serve over hot noodles or mashed potatoes.